We're right in the middle of spring now. Flowers are growing, hemlines are shortening... and I am sneezing. Oh hay fever, how I do detest thee. I'm not partial to pumping myself full of chemicals, but I had a terrible season last year, so when the first symptoms struck this time around, I surrendered immediately. Tablets and sprays, here I come! So far, they seem to be working. Fingers crossed. Meanwhile, I still like the idea of getting a little boost from natural remedies. Garlic is purported to be good for fighting hay fever. Apparently chilli also helps. 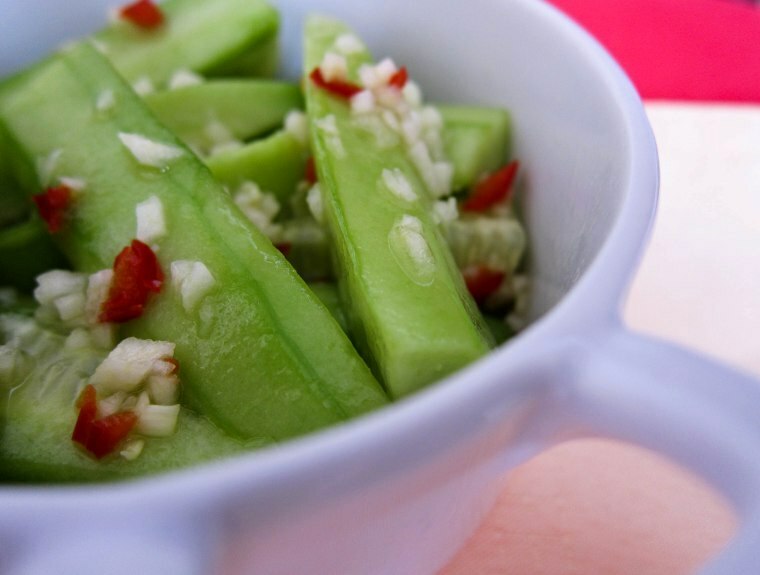 With that in mind, I made this easy Chinese-inspired cucumber salad over the weekend. Boy, this may be a simple recipe, but it sure is potent. The cucumber is hacked up like firewood, bombarded with minced garlic, scattered with chilli and drenched in sesame oil. Subtlety be damned, this is a dish that shoves itself deep into the receptors of your taste buds and smirks, "here I am!" Toss all ingredients together till well-combined. Lightly toss again just before serving. 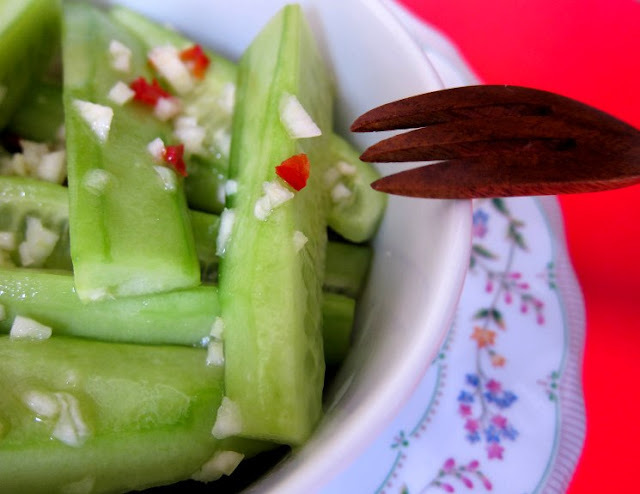 While sharp and satisfying at the time of consumption, this cucumber dish WILL result in hours of gloriously pungent breath. Not recommended for romantic dates, unless both parties have a garlic fetish. Now, I have no idea whether this did anything to alleviate my hay fever, but I'm sure it did me good anyway. If you've had any success with natural remedies, do let me know! Subtlety be damned indeed! I'm with you on the hayfever thing. Our street is a shocker for that I think. Love this simple, fiery recipe! Perfect for the warm weather. Thanks Yas! I hope you've been coping with it well. Fabulous! Even if it didn't provide immediate relief, all that chilli and garlic has to be good for you! I looked at the first line and felt incredibly jealous. the weather here in the uk is getting increasingly colder ): wish it was spring. the cucumbers look really fresh and yum! I get hayfever alot and I have a cold at the moment. I think I should give this a go! This would go perfectly with congee! Oh no Apple, feel better soon. I like sipping on hot ginger tea or a warm honey and lemon when I have a cold. I too suffer from hay fever, it is a nightmare at the moment. I am all about the sprays and pills, but a wet cloth on my face also makes me feel good after a sneezing attack. LOVE this salad. Would be great on its own or as a side dish with steamed chicken. YUMMO! ohhh a perfect little side dish! I think this is a beautiful recipe that I always order in Sichuan restaurants. It's so easy and I wonder why I have not done this at home, especially in summer! Thanks chopinandmysaucepan! I too was inspired by my local Sichuan restaurant, though I believe their version has been gently cooked so the end result is quite different. OH my goodness I need some of this immediately! Not only do I love garlic but it's good for hay fever too?! I've been suffering from such bad allergies lately. Oh no! You mean there's something wrong with a garlic fetish? Seriously???? Hey Sylvie, I'm not sure how much garlic helps, and it probably depends on the individual as well. Some of my relatives use garlic and horseradish tablets during hay fever season with some degree of success. But either way, I'm still happy to up my garlic intake! I like how in your neck of the woods this is called lebanese cucumbers! Here in the US they are called Persian! No problem, the main issue is that they are crispy crunchy and taste fresh! I would look into herbal teas for your problem, but still the salad sounds perfect! Oh no! How terrible to suffer so badly with allergies. I love this time of year for the gorgeous pollen smell, it would be terrible not to be able to enjoy it. I usually make this with sesame oil and red chili flakes, a little soy sauce and sugar! simple but so good, as a side dish. My mom makes something similar to this dish! Helpful... I didn't know garlic had such properties. I always have allergies so I'll just have stinky breath from now on! Looks amazing :) And anything with garlic is basically a must-eat. This recipe ends up in my favorites. Thanks foodie! I'll check it out. Well, even though it's getting to be fall here I think this would be great to combat a case of the chills! This cucumber salad looks great! So crispy, with a flavorful dressing! That is a great looking salad and as a fellow hay fever sufferer perhaps I should give the garlic diet a try. Love this recipe think I may have to give it a go this weekend! Thanks RowShan, hope you like it!